- skj on 十一月 19, 2016. Earlier this week we attended a press preview event for FAMO Sandwich Creations before they officially opened to the public on Wednesday ( November 16), at 122 Sherbourne Street. Specializing in sandwiches featuring meats with a nose to tail philosophy, owner Shabnam Moier and owner/chef Babak Fahmi (formerly of Terroni) have created a warm, inviting space with a distinctly rustic feel. The Six with shaved Grano Padano was delicious, with delicately sliced slow braised beef tongue with truffle mayo on fresh arugula slaw and a crusty French baguette. Served with housemade green chili hot sauce, it is definitely a must try. Accompaniments included crisp fingerling potato fries and green apple slaw, both freshly made in house daily. Also available are beet slaw and fennel slaw which features both fresh and dried fennel for a double fennel experience. Each slaw is tossed with a vinaigrette dressing which is a nice hit of acid that complements the richness of the meats on offer. 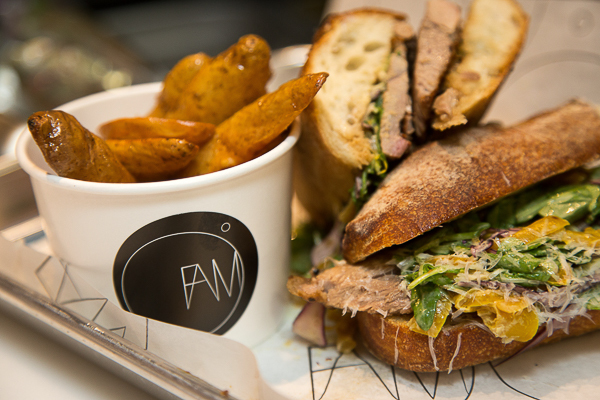 FAMO is a novel concept for the area which is predominantly filled with fast service lunch options. Fresh local produce and Petit Thuet breads are thoughtfully paired with cuts of meat rarely seen in such a reasonably priced sandwich. Tongue, lamb, beef cheek and brisket are among the sandwich choices on offer. Pulled pork and chicken are also available along with portobello mushroom and battered fish for diners who would prefer a lighter option. Beer and wine are available with a rotating selection as well as cold brew coffee from local favourite Station Cold Brew Coffee Co. on tap. FAMO is located at 122 Sherbourne Street in Toronto. and is open from Mon – Fri: 11 AM – 10 PM for lunch and dinner starting November 16. « Sinai Soiree 2016 in Support of Mount Sinai– A Roaring Success!